Hello Vintage: Murder by axe! 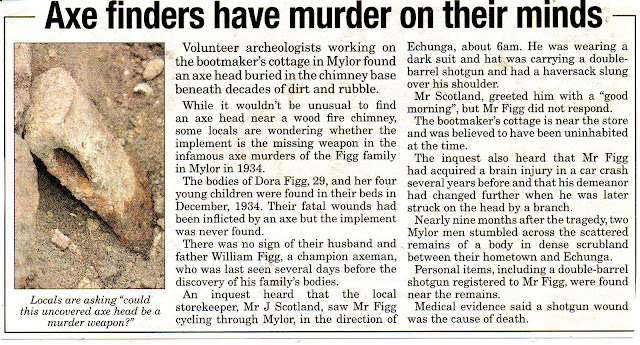 This article is from our local paper 'The Courier' this last Wednesday. Today the Hills is quite happening but even when I was growing up here, it was a quiet place. Back in 1934 it would have been very quiet. My Grandfather would have been young and working on the farm back then. Not the type of place that I would imagine an axe murder occurring. However as you see below I was quite wrong and I guess all towns have their bizarre goings-on. I can just picture Mr Figg riding through the town on a quest with a shotgun in his possession. A very sad story especially since Mr Figg was likely not himself his head injuries. I wonder if it was the murder weapon. What an intriguing story.